Sea sponges are a popular product that has many uses. They are sold in many different shapes, sizes, and forms. You can use sea sponges for bathing, applying makeup, cleaning and washing your vehicles, boats, and campers. With so many selections on the market it can be challenging to figure out which one is best for your needs. The best sea sponge comes from renewable resources and is made from Rock Island Sea Wool. Our top pick, The Natural Sea Sponge, is known for its durability, soft texture, and great absorption qualities. The purpose of this buyer’s guide is to take the guesswork out of the selection process by providing consumers with needed information. Educating yourself on these factors includes understanding the different types of sea sponges available and the applications that suit them best. We also provide information on how to choose the right sea sponge for your specific needs. 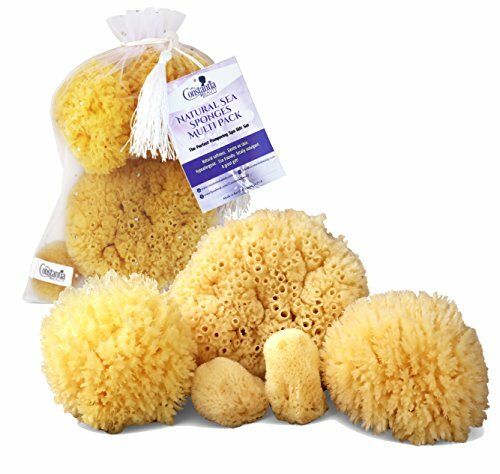 Constantia Beauty presents this pack of 5 sea sponges in an assortment of sizes. Sea sponges are a natural product that has multiple uses. They have natural anti-fungal and anti-bacterial properties. This company supports and respects the environment by only harvesting the sponges from renewable resources. The sea sponges in this multi-pack are the right size for applying makeup, washing your face, and using in the shower or bathtub. They are perfect for bathing infants- from newborn on up. The texture of these sea sponges is soft against your skin and offers gentle exfoliation. They are hypoallergenic and anti-bacterial, making them perfect for people with sensitive skin. This is the perfect gift and includes mini silk sponges that are super soft. They come in an organza drawstring bag that is ready for gift giving. These natural sea wool sponges are considered the best quality sponges on the market. They have been harvested in the Caribbean from renewable sources. Their super soft texture, especially when wet, is perfect for sensitive skin and for use on infants of all ages. Due to a sea sponges’ anti-bacterial properties, they don’t develop a wet or moldy smell. This anti-bacterial property also prevents the growth of bacteria, mold, and mildew. These sea sponges are hypoallergenic and toxin-free. They produce a rich later that reduces the amount of body wash or soap you need. Sea sponges last a lot longer than synthetic sponges which makes them an excellent value. They can be stored in the included net bag for easy, long-lasting storage. The open-weave bag provides fast, well-ventilated, air drying for your sea sponges. This 100% biodegradable sea sponge is at the top of our list when it comes to quality. It is known for its durability, absorption, pliability, and soft texture. 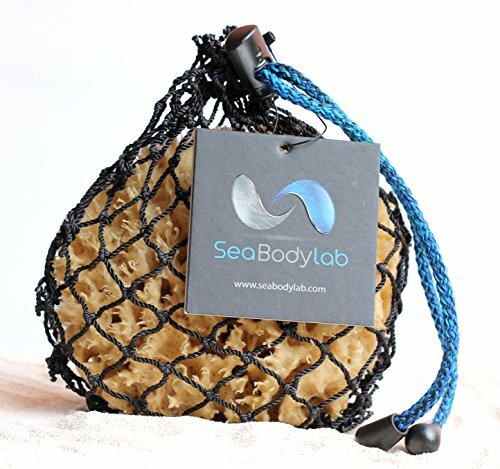 This environmentally safe sea sponge is made from natural sea wool which makes the best sponges. They are native to the waters around Florida. This sponge by The Natural Company, measures 7-8 inches in diameter. The measurements of this sponge are recorded when the sponge is wet. 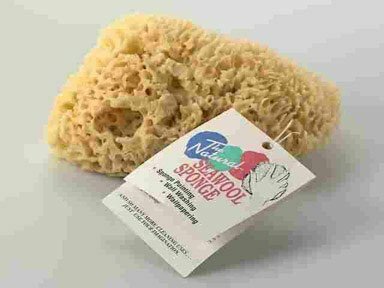 This sea sponge is the perfect sponge for using in the shower or bath and people of all ages, including infants, can use it. You will love the soft texture of this sea sponge. If you have been considering purchasing natural sea sponges because you’ve heard how great they are, stop just considering and make the decision to purchase one of these incredible products. Sea sponges are an all-natural sponge that is perfect for gently exfoliating your skin while providing a luxurious bathing or showering experience. They can also be used for cleaning and art applications. The super soft texture, when wet, won’t scratch or harm sensitive skin or expensive vehicle finishes. The three, top-rated sea sponge products listed above are perfect examples of the kind of quality you want to look for when shopping. Any one of these choices would be a good fit for you. If you don’t see what you’re looking for with these three products, continue reading the buyer’s guide below to learn a lot more about sea sponges and how to choose one that you will enjoy. The following information will teach you about the different kinds of sea sponges and what tasks they are best suited for. You will also learn what to consider when you are researching different types. This information will help you make an informed decision. There are some significant differences between natural and synthetic sponges. We listed some of those differences below. Natural Sponges – These sponges are long-lasting and absorbent. They don’t retain odors nor will they become stained. The texture of a natural sponge is less abrasive and provides much better cleaning than other types of sponges. Natural sponges are also often used by artists and craftsmen in decorative applications. Synthetic Sponges – The materials used to make synthetic sponges are cellulose polymers. The ridges and crevices that occur in natural sponges are not able to be synthetically duplicated. Man-made varieties are made with rubber or nylon and are bad for the environment as they generate a lot of pollution in the processing. There are a few tips provided below that will help you choose the right size sea sponge for your needs. Bathtime – A good size sea sponge for bath use is 5” to 6”. The smallest sponge size you want to get would be 4” to 5”. If you have large hands the 6” to 7” size is just right. Large Cleaning Jobs – Many people like to wash their vehicles, RVs, campers, or boats with sea sponges to ensure a thorough cleaning without damage to the paint job. Sea sponges are perfect for this. The best size sponge for this job will range from 7” to 9”. People with large hands will want to choose the larger sponges. These larger sizes will cover more surface area. Sponge Painting and Art – Sea sponges are perfect for sponge painting or decorative painting of any kind. For this type of application, Rock Island Sea Wool or Prime Sea Wool sponges are the best because of their texture. The right size will depend on what you are doing with it. Rock Island Seas Wool Sponges have a firmer texture than Prime Wool Sponges. The firmer texture provides a more consistent pattern. If you are doing small artistic projects, you will like the feel of the 3” to 4” or the 4” to 5” sea sponges. If you are painting walls you will have better results with the 5” to 6” size or the 6” to 7” size. There are two types of sea sponges on the market: form style and cut style. We explain the difference between the two below. Forms – Forms are the uncut, complete sponge. It will have a flat bottom where it was cut during harvesting and the rest of the sponge will be round. Forms make good display sponges for a bathroom arrangement because they can easily sit flat. Cuts – Cuts are when a larger sponge is cut into smaller pieces. Cuts will have a round top and two flat sides. Cuts make good every-day sponges. When sea sponges are wet, it can be very difficult to tell the difference between Prime Wool and Rock Island Wool. Once dried, the differences are easier to see. Rock Island Sponges are denser and can hold more water than Prime Wool. Prime Wool is well suited to use in sponge painting because it will hold its shape better. Rock Island Wool sponges are the best choice for household and commercial applications because they last longer than Prime Wool and can handle heavier use. Prime Wool is well suited for bath and shower use since they are said to be softer in texture and less expensive too. Rock Island Wool sponges will typically last about 6 to 9 months. Prime wool will last about 3 to 6 months. When sea sponges are first taken from the ocean they are so dark in color that they are almost black. They are processed with peroxide until the color is bleached out and the resulting color is light yellow-beige. Different tones of yellow-beige indicate how long the sea sponge was processed with peroxide. The lighter the color, the more time was spent bleaching them. Below are a few different applications for sea sponges and the type of sea sponge best suited to that task. Washing Your Car/Boat/RV – Wool sponges are softer in texture than other types of sponges and therefore are the best choice for washing vehicles. Household Cleaning – For regular cleaning around the house use a yellow or grass sponge, or even a loofah. There are all, typically, a good value and have a texture that works well for removing soap scum and grime. Bath and Body Washing – Wool sea sponges are the best choice for bath and shower use. The texture is very soft and they last a long time. A good alternative to the wool sponge is the grass sponge. It doesn’t last as long but costs less than wool sponges. Washing Large Animals – If you have a horse or large dog that you bathe on a regular basis, you can use a wool sea sponge to bathe them with great success. The larger the sponge, the better. Exfoliating the Skin – Yellow sponges have a texture that is slightly rough, making them an excellent choice for exfoliation. Loofah sponges are great also since the texture works well to remove dead skin. In this section, we provide you with information on where different types of sea sponges come from. Grass Sponges – The Gulf of Mexico is the area most prolific in growing grass sponges. They also can come from the Bahamas. Silk Sponges – These soft sponges come from the Philippines, the Mediterranean, or the Bahamas. Rock Island Sea Wool Sponge – These popular sea sponges come from the Gulf of Mexico. Prime Sea Wool, Yellow, Vase, Glove and Finger Sponges come from both the Bahamas and Key West. To improve the life span of your sea sponges it is important to disinfect them on a regular basis. It is best to disinfect the sponges every 2-3 weeks. This will extend the life of the sponge significantly and will ensure you have a fresh, clean sea sponge to use. Take the following steps for proper disinfecting and cleaning. Run the sea sponge or loofah under cold, running water for a few minutes until soaked. Soak the sponge in a bowl and add two tablespoons of vinegar. Leave in the vinegar water for two hours. Set the sponge on a clean surface to dry. Use as needed then repeat the cleaning/disinfecting process again in two weeks. Don’t boil your sea sponge or use harsh soap. This can shrink the sponge and significantly shorten its usefulness. Avoid the microwave as it can change the molecular structure of the sponge. Replace sea sponges every 6 months for the best results. Sea sponges are used for a variety of tasks from bathing to cleaning your family vehicle. There are many different types and sizes of sea sponges on the market. Hopefully this buyers guide has provided you with some new and helpful information to help you make your choice. Remember that Rock Island sea sponges last longer and do better under heavy use than Prime Wool types. The three, top-rated sea sponges featured above are great examples of high quality sea sponges. Any of them would make a great choice. If none of our three top choices appeals to you, use the information that you learned from the buyer’s guide to find the best sea sponge for your specific needs.